The Excel file that contains the code can be downloaded below. This file contains code for filtering different data types and filter types. 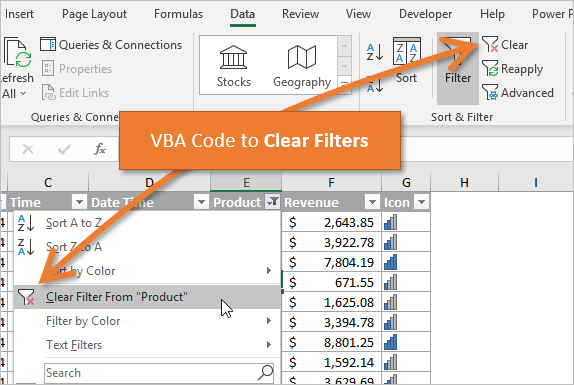 Please see my article on The Ultimate Guide to AutoFilters in VBA for more details. We use the ShowAllData method to clear all filters applied to a range. Only one filter range can be applied to a worksheet, so we are actually clearing the filters on the sheet. 'no filters are applied. Does not work for Tables. If there are no filters are applied to any column, then the ShowAllData method will raise an error. It's a Run-time ‘1004' error with the description: Method ‘ShowAllData' of object ‘_Worksheet' failed. The On Error Resume Next line will bypass that error. On Error GoTo 0 resets that so errors are raised in any lines of code below. Note: When the ShowAllData method is referenced as a member of the sheet, it does NOT clear filters that are applied to Excel Tables (ListObjects) unless a cell is selected in the Table. Therefore, it's best to use the code below for Tables. To clear all filters on an Excel Table (ListObject) we also use the ShowAllData method. In this case, ShowAllData is a member of the AutoFilter property of the ListObject object. The code above will only clear filters for a single Table. We can loop through the Tables on the sheet to clear all filters from each Table. To clear filters on a single column we use the AutoFilter method. 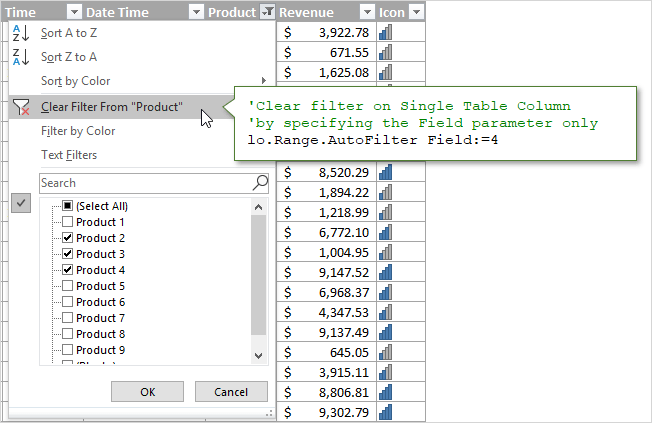 We only reference the Field parameter and set the value to the number of the column we want to clear. The Field is the column number of the range the filters are applied to, NOT the column number of the worksheet. The same technique is use to clear filters applied to a column in a Table. In this case the AutoFilter method is a member of the Range object of the ListObject. The filter drop-down menu options change based on what type of data is in the column. We have different filters for text, numbers, dates, and colors. This creates A LOT of different combinations of Operators and Criteria for each type of filter. I created separate posts for each of these filter types. The posts contain explanations and VBA code examples. The file in the downloads section above contains all of these code samples in one place. You can add it to your Personal Macro Workbook and use the macros in your projects. I lose quite a lot of time on forums to find a solution to clear filter in a listobjects. Your solution work properly. Dear Jon, This is outstanding.